Error message when you use Web Services for Microsoft Dynamics GP: "An ISO 4217 Currency Code must be three characters long; your value is"
Error message when you use Web Services for Microsoft Dynamics GP: "Instance Validation Error: "" is not a valid value for PurchaseOrderType"
Recently I was asked to take the Certified Payroll report that comes with Dynamics and add Olympic Project Cost data to it. The query that runs the report is below. This script depends quite a bit on the customer's data, and needs to be modified before use. If you don't have SQL chops, don't do it. I had the chance to shake hands with Beat Bucher (pronounced: B@) at GPUG Summit 2016 last week, glad to finally make the acquaintance. He's such a faithful contributor to the community. At any rate, he's posted a SQL Security script on the GPUG user forum this morning and I'll re-blog it here so that it's always available to me. The query will show you the Dynamics users for a company and if the user is using the SQL 'Enforce Password' policy and the 'Expiration' policy. Great auditing tool. This customer was a little more difficult than most, we had to add TAXAMNT, TAXSCHID and IVITMTXB = 1 to the line and FREIGTBLE = 2 to the header to get it to go. Usually that's not required. I was wondering if there are other ways to integrate data into GP other then eConnect, Integration Manager, and web service. It seems that these are the only options available. Currently we are using eConnect to integrate data from Bullhorn (CRM) into GP. We are using the Project Accounting Module. I am looking into using BiZTalk, but it seems I still need to involve eConnect. What I am trying to find out if there are other better options out there. GP PO Receiving Entry "Purchase Order Line Item does not exist"
I'm writing an econnect import for POP Receiving Transaction Entry in Gp10. I had it working for a while (purely doing it via SQL) - no XML. I have recently come accross a situation where the Receipts don't match to the PO line items, but the should! I'm at my wits end. I setup a PO and Receipt like i usually do in test and make sure that the PO is in the system (only one line on the PO). My values are as follows. POLNENUM = 16348 (and it matches the ORD number on the PO for the same line item. VNDITNUM = "2016 BPO" (noninventory number) - used to work with this value blank also. *** Unit Cost DOES NOT Equal Unit Cost on the PO. there is a difference. Is this the culprit? I get the error message taError code 2053: Purchase Order Line Item does not exist." but it does! If anyone can assist... I am using the [taPopRcptLineInsert] proc. and I looked at the other posts here that show how to use the POLNENUM as a multiple of 16348. Any ideas on how to troubleshoot are welcome. We have an General Journal entry that is suddenly experiencing an error preventing posting. DOC 1 ERROR: Field 'Reference' does not have a default value. Please advise on any other details I can provide to help resolve. 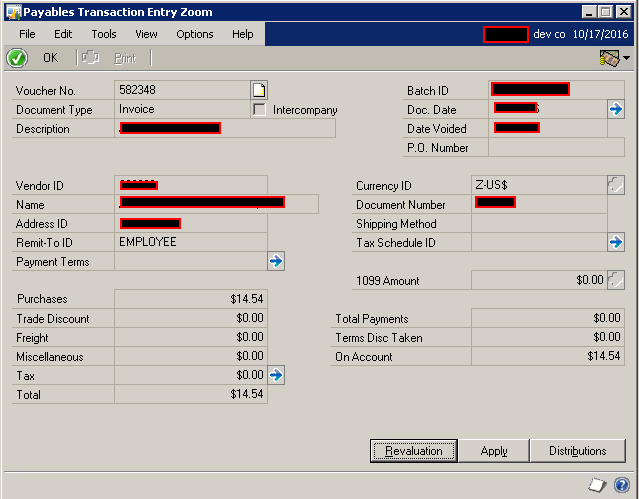 How can I locate the transactions associated with a Batch? Decimal Places passed in on UNITPRCE does not match setup. We aren't registered for Inventory Control in GP 2013 R2 (12.00.1920). But, we have service items held within the Item Maintenance window. These are imported through Integration Manager. Also, we're in a Multicurrency environment, even though the company that this happened in transacts only in Z-US$. Our currency decimal placement for items is 2, as shown in both Item Currency Maintenance and in Sales Order Processing Setup for noninventory items. Anyway, the resolution was to create a new service item in Item Maintenance. You see, Integration Manager was trying to import--again--an item that did not exist in Item Maintenance. True, Integration Manager indeed had given us an error saying that the item does not exist. But, why would it also mention a decimal placement error? To our administrators, this decimal placement error was misleading. They spent a long time trying to figure out how to fix the decimal placement when, in reality, all that was required was to set up the new item in Item Maintenance. The administrators told me that they want me to "fix" this error message so that it states what the actual problem is. I tried telling them that the error messages are not customizable and that they can be misleading. In any case, they want to know what we can do for faster identification of the real cause for issues preventing Integration Manager from successfully importing. 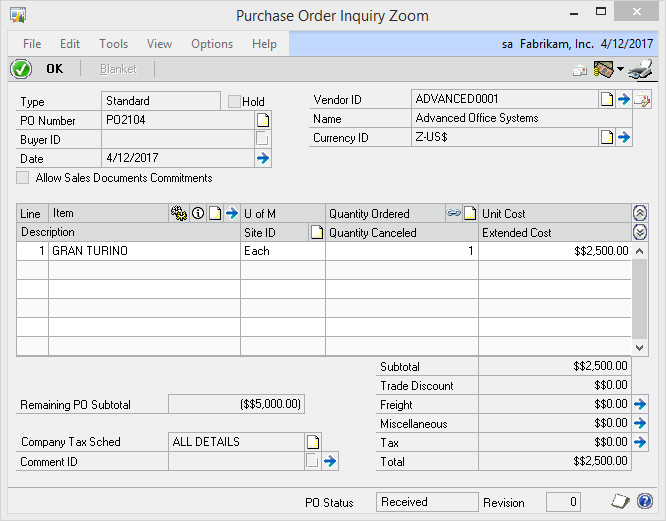 I am getting these errors when importing a sales transaction with taxable freight. I have tried variations in my data but still get the errors. Only thing that worked was making the freight tax a line time with $0 extended. What node and what values are required to import taxable freight on the header? I do not want GP or SmartConnect to calculate the taxes we are pushing the values from a POS system. I have created a SQL query that pulls data from the following four tables: RM00101, RM20101, RM20201, and CN00500. The query is taking nearly two hours to execute and to display its data in SQL Management Studio. In researching this, the majority of T-SQL experts advise placing indexes within these four tables. Truthfully, I hesitate to do so for two reasons. First, I have read that having additional indexes can actually degrade SQL performance. Secondly, without the "supervision" of a Microsoft engineer, conducting modifications directly to the GP tables can corrupt those tables and, therefore, compromise GP. Regardless, is there any harm of placing additional indexes into these tables? If so, per Microsoft Dynamics Best Practices, what is the way to go about doing this? My query is, in essence, a big select statement. Would simply creating a stored procedure containing this query and executing the stored procedure allow for the data to be displayed much more quickly than two hours? By the way, I found the article below in italics saying that, within reason, indexes can be added to the four tables. Based on the syntax mentioned in this article, can you please advise me on what indexes I need to create? I can test in our development environment and advise our DBA of such. Otherwise, I have heard that using temp tables and indexing in those temp tables would be a good idea. Does anyone have any SQL views that could be posted here to make such temp tables? When hundreds of thousands of records exist in a single table in the database, things can slow down a bit. If the application is looking for information using a key, then this number of records should not be a problem. But to look for a single customer, for example, using their phone number, when the phone number is not indexed, can take some time in a large table. Supplemental indexes can be added to these tables! Don't get too carried away as too many indexes will slow down the process of adding or updating records as all of the indexes need to be updated as well. But having 3-4 additional indexes should not be a problem. The following command is typed into the SQL Management Studio in a query window to create a new index. Make sure to backup your database first and do this when no one else is on the system so mistakes can be corrected. index_name is a name given to the index. The ERP system uses the rule AKtablename99 to indicate an Alternate Key on the table and serializes the keys. I use RLWKtablename99. Use what you want. column_name is the name of the column the index should be built upon. Two or more columns can be specified if needed but separate each with a comma. If the index should be in decending order, add DESC at the end of the command. I am using GP web service method "CreatePayablesInvoice" to generate a payable voice for an attorney. I'm able to post invoice successfully from C# MVC web application, but when I go to GP client and post the batch from series post it shows error message. 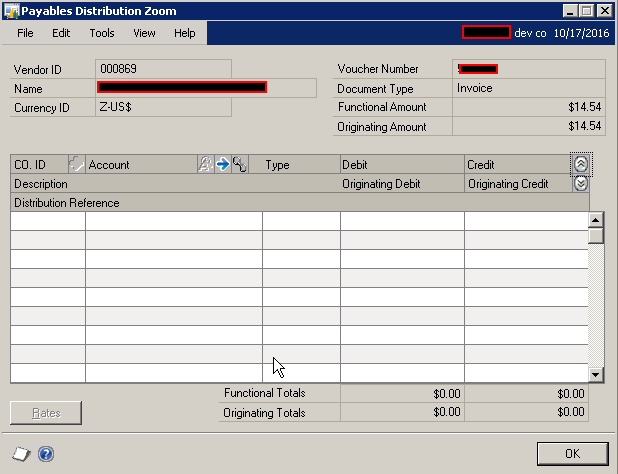 Error Message : The accounts payable distribution(s) does not equal the actual amount.The purchases distribution(s) does not equal the actual amount. While debug I find that, the post is not able to pick payable and purchase account(attached screenshot ), which might cause the error. Please suggest how to fix this issue. We've done some customizations that allow a user to launch an executable from within the GP Windows client, but we're experiencing different behaviors that we're unable to explain. In some installations, it is required that the external executable be located within the GPRuntime\MyDevCompany directory. In other installations, it is required that the external executable be located within the GPRuntime\Data\MyDevCompany directory. Note that default security has to be modified for this to work, as end users are denied the ability to traverse or run executables from within this directory per Windows security settings. What determines the location from which GP is launching an external application? The issues apply to both GP 2015 and GP 2016. The results in the three "Emp Count" columns doubles each time I add one of the JOINs. Why? Can I set up a GL Account which is automatically assigned to a dimension? Can I set up a GL Account which is automatically assigned to multiple dimensions? I am currently attempting to Import a sales order to GP using eConnect. I am able to get the document to upload but am unable to get taxes to generate using "CREATETAXES". I have tried several methods including the references on DynDevelopers; however, I was unable to get this to work. Here is my current XML file. I am currently attempting to pass taxes via eConnect but keep getting the following error. "Error Description = Payment total does not match line deposit + credit card payment total"
the ACCATNUM field of GL00100 table, describing defined to number 48 (Non-Financial Accounts). however in the chart of accounts of the company ACCATNUM reaches number 54. Where can I find the description of the ACCATNUM 49 to 54? Error Number = 4849 Stored Procedure= taPopEnterMatchInvLine Error Description = Either Item Number or Vendor Item Number is required Node Identifier Parameters: taPopEnterMatchInvLine POPRCTNM = RCT24507 Related Error Code Parameters for Node : taPopEnterMatchInvLine ITEMNMBR = Note: This parameter was not passed in, no value for the parameter will be returned. VNDITNUM = Note: This parameter was not passed in, no value for the parameter will be returned. If Item number is not required why is this error happening?? I am currently having an issue regarding Purchase Invoices. The push is successful but the subtotal against the PO returns a negative value. The subtotal against the PO SHOULD be 0 when it is closed out evenly like so. 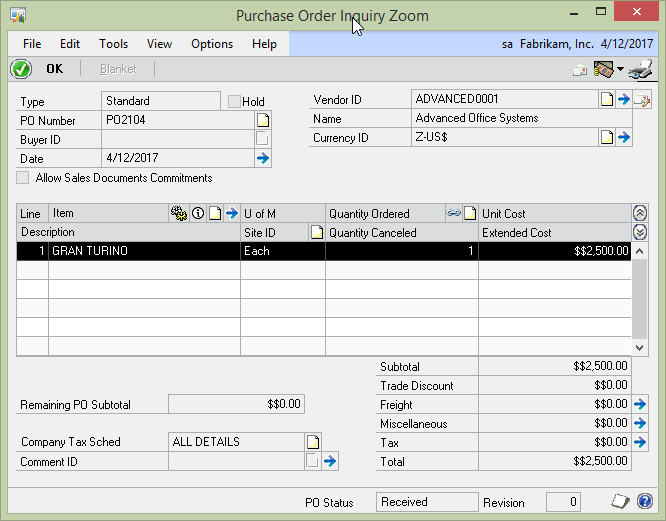 When the auto invoice functionality is used, the sub total is equal 0 and the Purchase Order is closed correctly. If the invoice is generated via GP Web Services then the subtotal is a negative on the Purchase Order. As you can see in the above picture, the total is 2,500 however its leaving the PO with a negative 5,000 balance.